Celebrating the life of Jess Frank Vincent Jr.
Be the first to share your favorite memory, photo or story of Jess. This memorial page is dedicated for family, friends and future generations to celebrate the life of their loved one. 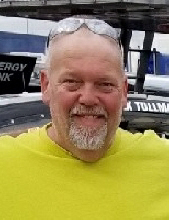 Obituary for Jess Frank Vincent Jr.
Jess Frank Vincent Jr., 53, of Beecher City, IL passed away unexpectedly on Wednesday, March 27, 2019 at home. Jess was born February 3, 1966, in Cincinnati, OH, the son of Jesse Sr., and Patricia (McNeely) Vincent. He was a truck driver for Charles Heuerman Trucking in Teutopolis for over 20 years, hauled for Doty Farms and was a volunteer firefighter with the Beecher City Fire Department for over 20 years. Jess attended the Evangel United Methodist Church in Beecher City, was a member of the OMRO mud races and the Greenland Masonic Lodge #665 in Beecher City. He enjoyed raising cattle, fishing, hunting, playing ping pong and spending time with his grandchildren. Surviving are his mother, Patricia Vincent of Beecher City; children: Kelsey (Shae McConkey) Vincent of Beecher City, Jess Frank (Heather) Vincent III of Sullivan and Dalton Vincent of Cowden; four grandchildren: Harlan and Coy McConkey, Waylon and Fallon Vincent; sisters: Pattie (Rick) Williams of Brownstown and Marilynn (Ron) Finke of Effingham. He was preceded in death by his father, Jesse Sr., and sister, Sandra Kay, at infancy. Funeral services will be held at 10:30 a.m. on Monday, April 1, 2019 at the Evangel United Methodist Church in Beecher City with Pastor Paul Bauer officiating. Burial will take place in Bob Doan Cemetery in Beecher City. Visitation will be from 3:00-7:00 p.m. on Sunday, March 31, 2019 at the Evangel United Methodist Church in Beecher City. Masonic rites will be held at 7:00 p.m. by the Greenland Masonic Lodge #665 of Beecher City. Memorials may be made to the family. Lockart-Green Funeral Home in Beecher City is assisting the family. Family and friends are invited to light a candle or share a story at www.lockartgreenfuneralhome.com. To send flowers or a remembrance gift to the family of Jess Frank Vincent Jr., please visit our Tribute Store. Or, if you would like to donate to the family, please visit Jess's Tribute Fund. Help ease the financial burden placed on the Vincent Jr. Family after the loss of a loved one by making a donation. Make a donation for Jess Frank Vincent Jr.
"Email Address" would like to share the life celebration of Jess Frank Vincent Jr.. Click on the "link" to go to share a favorite memory or leave a condolence message for the family. Provide comfort by sending fresh flowers from our local florist or donating to Jess's Tribute Fund.